This Friday I had the good fortune to have an unscheduled day to myself at the Oregon Gardens in Silverton. It was a real pleasure to spend hours walking at leisure through a well-planned, beautifully-maintained botanical garden. From a gardener’s standpoint, it’s incredibly useful to observe gardens or nurseries in the winter. Viewing plants in the off-season allows you to select for winter interest, and, if you also happen to be a beekeeper, very early bloom. The hellebores featured in this bed are just about to hit their peak in Silverton. My Coast Range hellebores just popped up last week and likely won’t be at their peak for another week or so, depending on the weather. These early bloomers have lots of visitors for at least two to three weeks, their drooping flowers protecting pollen and nectar from winter rains until the sun allows the bees out of their hives. Heath is another early-flowering garden perennial of special interest to honey bees and bumble bees. I haven’t had much success with it in the cooler Coast Range, but they thrive in Zones 7-9. Bees in the Willamette Valley and coastal areas can really benefit from this widely-planted ornamental. If you’re used to calling this plant “heather,” you are not alone. Heaths (Erica) and Heathers (Calluna) are members of the same plant family (Ericaceae) and have some very similar habits. 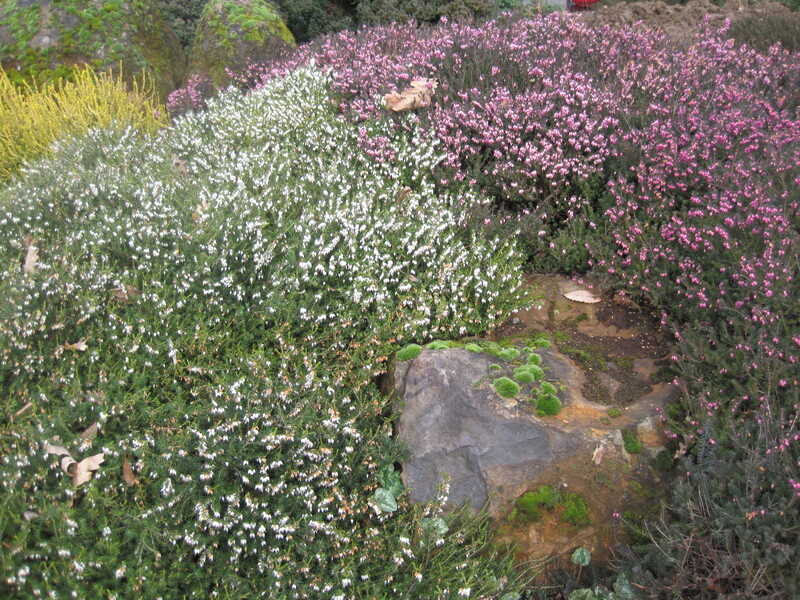 The plants we see blooming so beautifully this time of the year are typically heaths; the heathers are much more cold hardy and tend to bloom later in the spring and summer. Both groups have hundreds of species and cultivars. Voilà! As you may have guessed, they are very tiny, tucked in alongside leaf buds. (This must be what the guide books refer to as “insignificant”!) Because filberts are wind-pollinated, the plants don’t put much energy into showy flowers or nectaries, throwing most of their effort into producing copious quantities of pollen. Willows are also beginning to bloom here, providing another good source of protein, so much so that I’ve seen my bees kicking out their stored bee bread in preference for this fresher, more nutritious pollen. Though the big nectar flows are still ahead of us, these small blooms are a good inspiration for me to prepare my equipment, make sure my bees are doing well, and get ready for the rush of spring! 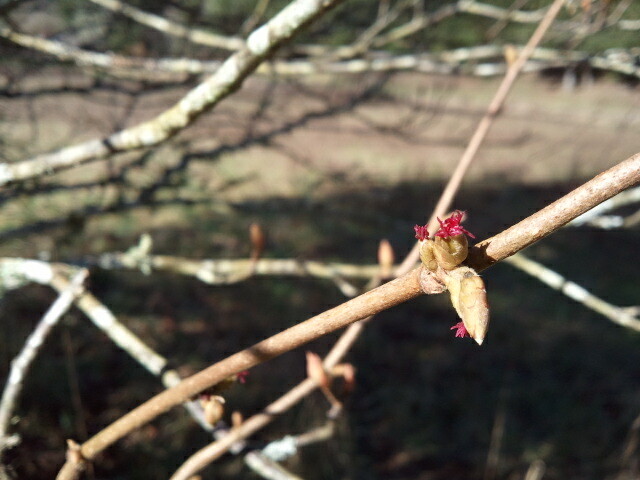 My willows are just starting to bloom. So far, in my microclimate: forsythias just coming out, magnolia trees in bud, tulip trees (poplars) blooming, red maple trees starting to bloom, first daffodils in bloom, crocuses starting to bloom. This means I need to do my first hive reversals weather permitting. I’m going to say “hurray willows” now while I still love them. (I have 25 to plant today in our riparian zone, and I may be feeling less generous about them in a few hours. ; ) Thanks for reporting in, Rebecca, and happy almost-spring! Judy, I love that you have these bloom events correlated with colony management tasks. Now I know what I’ll be doing two weekends from now when my microclimate catches up with yours!